Successfully Added MP4 + MP3 Player with 3.5 Inch LCD (8GB Monster File Edition) to your Shopping Cart. MP4 + MP3 Player with 3.5 Inch LCD (8GB Monster File Edition). A great portable media player for enjoying your free time. Who says you need to spend a fortune to have a great MP3 and MP4 media player? With ample multimedia features and sound quality second to none, this model is a cut above the rest, and at a budget friendly price. 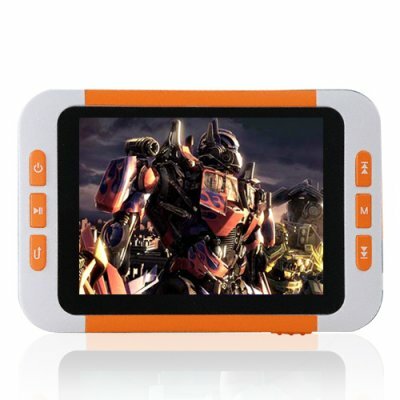 The large, crystal-clear TFT LCD screen makes it easy to view pictures, read text and e-books, and of course watch all your favorite video files with ease. With this model you will be enjoying multiple file types including MP4, FLV, VOB, WMV, MP3, WMA, OGG, FLAC, and more! That is more file types than the iPod and Zune can play put together!